Flare knockout drums, or FKO's for knocking out any liquids upstream of a flarestack, are stocked in sizes ranging from five through 100 barrels. 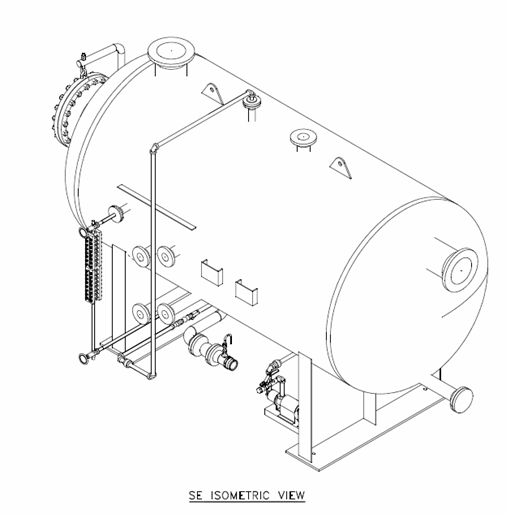 Pressures ranges include atmospheric and ASME code, ABSA -certified vessels. OilPro draws stock from a variety of sources in order to offer the best value available at any time. Scroll below for what's available. When you absolutely want the best options, think about OilPro's new stock 50# MOP, CRN'd, low temp, sour-ready offerings in 25, 50, 75 and 100 Bbl sizes compliant to most in-house spec. These are inexpensive and can be packaged for sweet service to be a viable alternative to secondary contained atmospheric options.while maintaining easy accessibility and design flexibility. Designed so it can sit on saddles, eliminating skid and house if desired for huge cost savings. Can easily accommodate less expensive threaded, blind-flanged instruments to save money. Controls can be in lean-to save money and civil engineering and piling costs. as FKOD's frequently see stagnant fluids anode use is strongly recommended. Stilling well can be Carbon Steel, Stainless Steel, Fiberglass Reinforced Plastic, ABS, PVC. 48" x 10' 25 Bbl, 250 psig-rated, used, inspected, UT'd surplus FKOD. Disconnected, ready to ship from highway accessible yard. Built in 2006 by Sunn 96, originally for Husky Oil. This package is used, but considered to be in B condition. VE, VI, UT were performed on this vessel. There were no concerns, this vessel is safe for continued operation. This vessel was in good condition. The insulation had no damage, the vessel was securely mounted on a skid. Not all of the external components were attached at the time of this inspection. The attached piping was properly connected (no short bolts, mismatched flanges). The vessel is safe for operation. Units are typically in stock. Flare Knockout Drum, 3' x 7', Sweet Service, 10 Bbl capacity, Packaged, 50 psi Design Pressure, AB Reg'd. 304 SST Float @ 0.5 SG and heavier. CA: Process Connection Size / Type: 4" CL150. Pump assembled to motor with guard and base. Note: 480VAC 50Hz motor was not available. 400VAC is standard in 50Hz but there is also a 220VAC available so we have proposed that configuration. Gaskets 1/8”, 316SS, Graphoil Filled. * Piping AB83 forms included for Owner registration of piping with ABSA. It is the owners responsibility to provide an inspector for pressure piping and sign off on AB-83 form. This must be completed by the owner before any piping system is put into service. 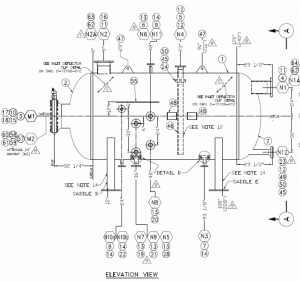 Process and Instrumentation and General Arrangement drawings, with one revision after customer markups, are included in the quoted price. If further changes or revisions are required after the first revision has been issued, extra charges for engineering and drafting are applicable. It is our policy that P&ID and general arrangement drawings in PDF copy are the only drawings that the customer will receive as part of the contract. A complete set of construction drawings will be made available to the client’s personnel during regular business hours. Delivery of package is Five (5) to Six (6) weeks after receipt of order, approved drawings. Flare Knockout Drum, 3' x 7', Sweet Service, 10 Bbl capacity, 50 psi Design Pressure, internally coated, SK Reg'd. -Load Out Line is 2" NPS Threaded non-code piping with 2" Threaded Ball Valve and Camlock. 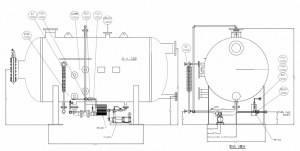 -Heater Fuel Gas Supply 3/8" tubing to off skid, MAWP 150 psig. 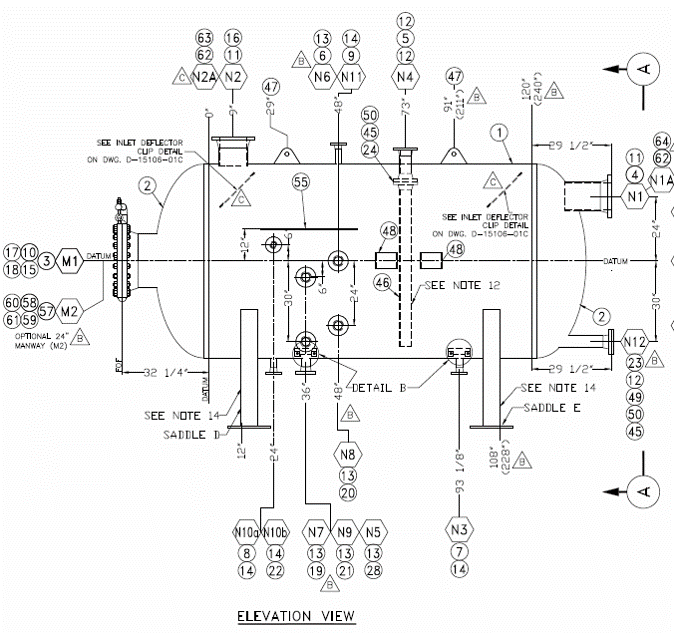 Process and Instrumentation and General Arrangement drawings, with one revision after customer markups, are included in the quoted price. If further changes or revisions are required after the first revision has been issued, extra charges for engineering and drafting are applicable. It is our policy that P&ID and general arrangement drawings in PDF copy are the only drawings that the customer will receive as part of the contract. A complete set of construction drawings will be made available to the client's personnel at NRG facilities during regular business hours. All equipment fabricated by NRG will be guaranteed to be free of manufacturing defects for eighteen (18) months from completion or twelve (12) months from commissioning, whichever is less. In order to maintain warranty, NRG must be notified immediately in the event of operational problems. One (1) C.D. 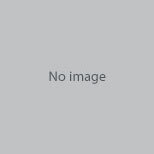 with operating manual and quality control manual, and One (1) Hard Copy of operating manual, information is included with the given price. The supplied RFQ specification has been adhered to as closely as possible in preparing this quotation. However in the case of a discrepancy between the RFQ and this quotation, this quotation will govern as to what NRG is providing. NRG is not supplying anything not specifically stated in the quotation. No provision has been made to move the unit from the work area. Charges may apply if package is not removed at time of completion. Unless otherwise agreed upon in writing a "lot" size for the purposes of piping non-destructive examination shall be considered the complete job. Purge gas connection in place on vessel if wanted. Note: Inlet and outlet connection (outside the building)standard is A-333 pipe and LF-2 flanges for low temperature applications. Delivery (ARAD): 2-4 weeks (currently 1 in stock), but depending on shop load at time of order. 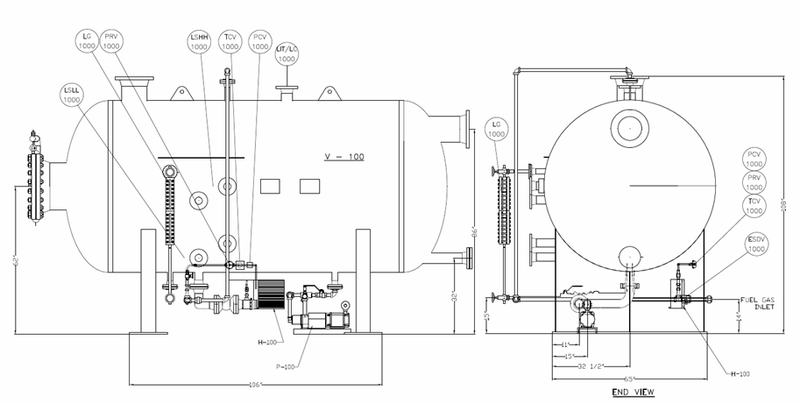 Flare Knockout Drum, 4' x 10', Sweet Service, 25 Bbl capacity, 50 psi Design Pressure, SK Reg'd. Please allow a typical 8-10 week delivery a.r.a.d, a.r.o. New, surplus Tornado-built, Non ASME Flare Knockout Drum. New, never used, built in Dec., 2005. Drain and vent line on cage. Self-framing Panel door c.w. slide lock. Unit is deliverable immediately, Exw. Nisku, AB. Quality Control Package included, electronic. Flare knockout drum skid mounted and housed. • All necessary valves, gauges, fittings and pipe included. 8’ dia. FKOD DW c.w. ZCL fiberglass internal tank and cradle. o 3” 150 FF FRP interstitial monitor c.w. vacuum gauge assy, DW.
? All nozzles supported by galvanized beams or galvanized angle for full support. • Cradle is galvanized and filled with lightweight cellular cement for support. • The top half has 100% recycled rubber to protect the top half of the tank during backfilling. • 3” 150 FF FRP interstitial monitor c.w. vacuum gauge assy, DW. • All nozzles supported by galvanized beams or galvanized angle for full support.